Though zodiac wheel depicts Earth's movement around the Sun, it is still needed to take into account the rotation of the Earth around its axis itself which is also called diurnal rotation. Every 24 hours zodiac wheel makes a full circle moving clockwise. Commonly believed that circle has neither beginning nor ending, but from astrological point of view the starting moment of the new life is a mysterious beginning of the circle. The starting point is always located to the left from the chart and astrology has a term for it: Ascendant or Rising Sign. Ascendant is the eastern point of the moment and location of birth and is the precise degree of 360° wheel that went through the eastern horizon when the owner of the chart. It points out the crossing of the ecliptic with the horizon or in other words the crossing of Earth and the sky. Through the Earth's rotation the full zodiac circle passes over the Rising Sign every day. Around every 4 minutes the Rising Sign changes its degree. The horizon in the chart is symbolized by the horizontal line inside of the circle from the eastern point (Ascendant) to the western point (Descendant). The meridian is a vertical line inside the circle which stands for due south (which is at the top of the wheel) and the due north ( which is the bottom of the wheel). The intersection of horizontal and vertical lines is called cross or astrological angles and it is associated with the mix of divine and humanly, the Earth and the sky, heavenly design and human implementation. The planets situated in the upper part of the birthchart correspond to those over the horizon by the particular moment and location the chart shows, and the planets situated in the lower part - to those under the Earth. For example, let's take the birth at dawn, we will see that the Sun will be in proximity to the Rising Sign or in other words to the eastern point of the chart. The Sun goes from east to west within the day and all the movements are depicted in the chart by its clockwise shifts to the upper part of the chart or to Midheaven also known as medium coeli (MC) which is situated at the due south by the moment of birth. For anything that happens around noon the Sun in the chart will be situated somewhere at the top. Opposite to Ascendant is located a Descendant or a western point in the sky. Anything that happens near the evening or in the afternoon will be located in the western part of the chart. After the sunset, the Sun goes down the horizon imumcoeli (IC) or 'under' the Earth in a clockwise direction. This time is associated with midnight and a person born in this period will have the Sun in the lower part of the chart. The Sun then moves to morning until the break of the day and it is again visible from the east or in the area of the Ascendant. 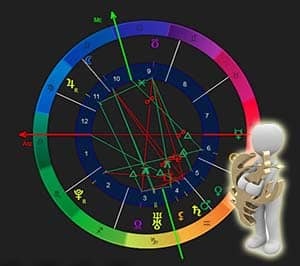 One of the ways to check the trustworthiness of the chart is to check the actual hours of the needed event and the position of the Sun in the birth chart. For instance, the person came to life around 6:00 A.M. and you see that the sun is at the top of the chart (though it should be somewhere in the eastern part), so you understand it is wrong. The horoscope is the crossing point of heavenly world and a human one. The most basic structures like the cross and the circle can provide us with profound understanding of its interaction, and can serve as baby steps for direction in astrology and lead us through our inner and outer paths.